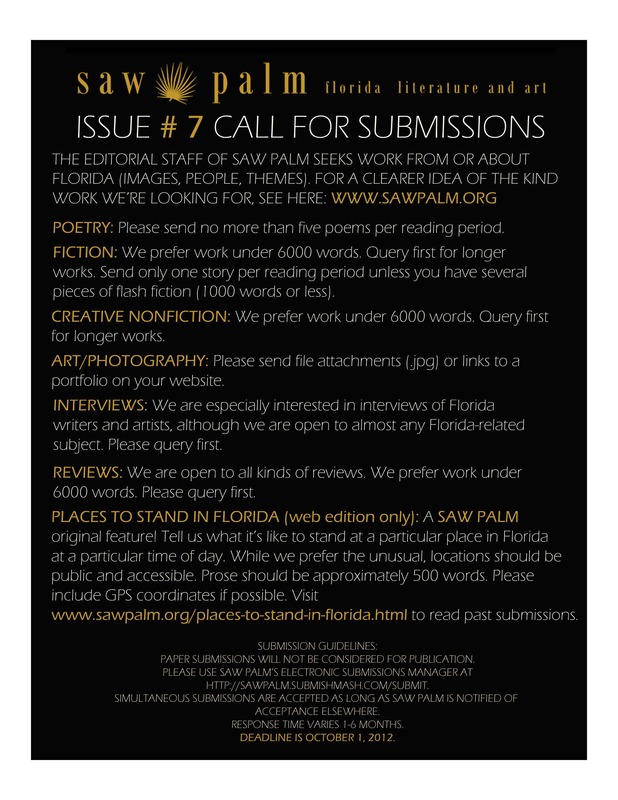 Christine Lasek, the managing editor for Saw Palm Issue #7, invites FSU art students to submit fine art and photography for publication in Saw Palm. Saw Palm is the University of South Florida’s literary magazine. Annually, they publish the best fiction, nonfiction, poetry and fine art from and about Florida. For more information, please see the attached flier. POETRY: Please send no more than five poems per reading period. FICTION: We prefer work under 6000 words. Query first for longer works. Send only one story per reading period unless you have several pieces of flash fiction ( 1 000 words or less). CREATIVE NONFICTION: We prefer work under 6000 words. Query first for longer works. ART/PHOTOGRAPHY: Please send file attachments (jpg) or links to a portfolio on your website. INTERVIEWS: We are especially interested in interviews of Florida writers and artists, although we are open to almost any Florida-related subject. Please query first. REVIEWS: We are open to all kinds of reviews. We prefer work under 6000 words. Please query first. include GPS coordinates if possible.